In this workout, Alternate between 20 seconds of battle rope & 20 seconds of rest. You can do a different battle rope exercise or just stick to 1 to keep it simple. Repeat the 20 Seconds of Work & Rest 8 times for a total of 5 minutes. Repeat up to 4x for a FULL 20 minute workout. Repeat the 20 Seconds of Work & Rest for at least 10 minutes. Repeat 2-to-4x for a FULL 20-to-40 minute workout. Do any battle rope exercise for 20 seconds. Do 20 seconds of another NON-battle rope exercise at a high intensity. Repeat for 1-thru-6 FOUR total times for a FULL 18 minute workout. In this workout, Do any battle rope exercise for 20 seconds immediately followed by 20 seconds of another NON-battle rope exercise at a high intensity. Do this 7 minute workout 1-to-6 times per day. Do this 7 minute workout at least 2 times back-to-back. BUT Take a 1-to-2 minute break after each 7 minute workout. Do it 2-to-4 days per week. Do this 7 minute workout at least 4 times back-to-back. BUT Take a 30-to-90 second break after each 7 minute workout. Keep doing 1 & 2 without stopping for 2 minutes or 6 times in a row. Rest 40 Seconds before doing it again. Do 1 of the top 12 battle rope exercises for weight loss shown in the video above ↑ for 20-to-40 seconds. After that, Rest 20-to-40 seconds. Keep repeating the 20-to-40 second battle ropes & the 20-to-40 second rest cycle for at least 5 minutes or 8 times. Rest 1 minute after 5 minutes. Finish after you've done it 10-to-40 minutes. The best way to use battle ropes to lose weight is to workout in an Interval or HIIT style. Watch the Video below or see 10 Rules to Lose 10 Pounds Every 3 weeks with HIIT to better understand how fat loss intervals work. Make sure you anchor the rope in place by wrapping it around a pole, weights (dumbbells or kettle bells) or even have someone who is stronger than you sit at the other end and hold the battle rope in place. 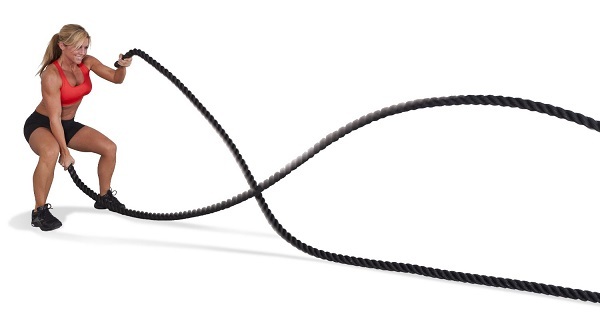 Battle ropes come in 30, 40 & 50 foot lengths of 1½-to-2 inch diameter. Use 1 side of the battle rope or put 2 hands on ONE rope if the rope you have is too hard. Not much for muscle, maybe a lttle firming up / toning. Powerlifting and crossfit over the past 4 years or so have given me lots of muscle but not the definition that I want. I have the motivation to workout and even turned the single car side of my garage into a gym. 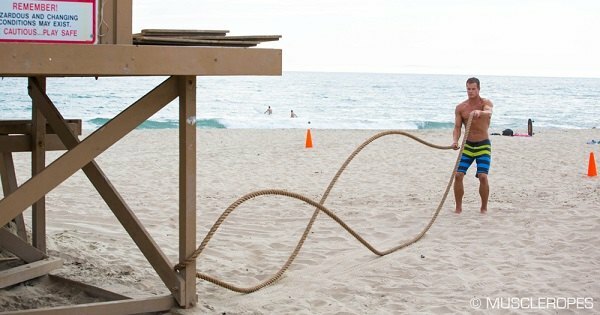 With the battle rope exercise can 30lbs be loss in 30 days? Whats the best plan to lose 100lbs in 7 months at 277 30 years old female? I want to get the body that I have always wanted, but I'm lacking the motivation to stay on a diet. Any advice? I am doing battle ropes 5to6 times a week 8 different exercises for 1 min each 3 times with a 30 second break in between each exercise but I am still having trouble losing belly fat any suggestions.I work the ropes hard and properly,I would like to lose 25LBs before my 72 birthday better yet by May 2017. I do a similar workout 9 different rope exercise 5 times a week 30 seconds hard then 15 second rest and I do 5 sets. I have same problem feel like I am getting great results except for the waist line and belly. I started to use battle ropes whilst sat on a Swiss ball as I have lower limb problems. Good to see you show an alternate sit down version to the stand up version. Battle ropes are a brilliant all round exercise regime for everyone! Excellent. I have 17 y/o basketball player who wants to work on his upper body. How many times per week do you recommend this workout. Thanks in advance. What is the title of the song playing during the rope workout? Props for the Sean Price track! I just started doing these so I do about 10 mins of 15 seconds rope/15 seconds rest. Will this be effective? That's an awesome workout, i've done that myself and its brutal. Keep it up and change things around to make it interesting. About how many calories do you burn with battle ropes? OK for example 8 different exercises 25 work (all out) 45 rest. All I'm looking for is a ballpark idea. Im 5'7" 220lbs, quit smoking and have asthma but I need to lose 80lbs preferably by summertime. What should I do?